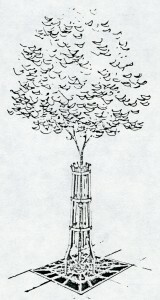 In 1984 the City of Payette planted twenty-four 15-foot maple trees along 8th Street. Spaced at four trees per half block these trees help soften the summer sun and enhance the shopping environment. Street trees are a major component of the business area improvement program. Trees are to be incorporated within all public rights of way, excluding alleys, in order to add a much needed natural amenity to the streets and provide a continuous and changing element that helps tie the downtown together as an identifiable place. The plan calls for planting a combination of maple trees and flowering crab apple trees along the remainder of 8th Street and side streets in the downtown. 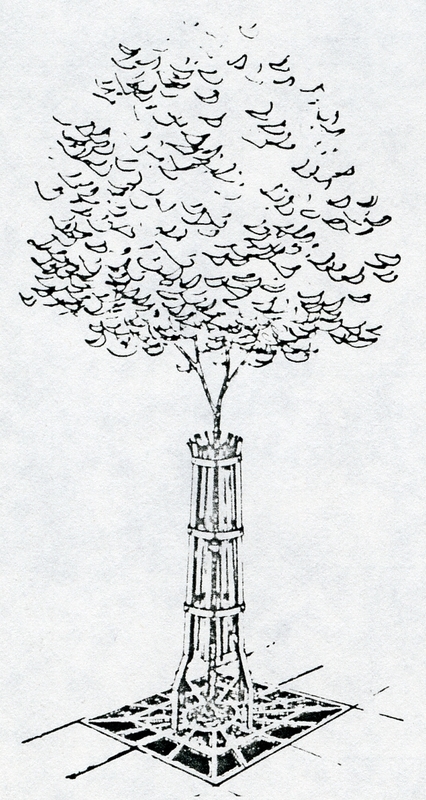 As illustrated in figure 32, four trees are planted on each side of the block. A four-foot square tree grate is recommended for both protection and aesthetic value. For areas of high vandalism tree guards should be utilized to protect the trees. Tree guards can be either bolted to the tree grate or to stakes. If tree guards are not used the trees should be well staked. An irrigation system is essential for the survival and low maintenance of the trees and should be installed when the sidewalks are being replaced.